Book kick offs with the attack on the Islamists in the Red Mosque by Musharraf and his Army which was done at the behest of China. The story goes somewhat like this: Few Chinese prostitutes and their pimps were apprehended by the so called moral police of the Red Mosque in Islamabad, China on learning the fate of its citizens who were held hostage in Islamabad threatened the Pakistani Generals, the Chinese of course donate billions of dollars to Pakistan every year and have an overbearing clout in Pakistan. Musharraf and his generals went overboard to make their masters happy. They ordered the Army towards the Red Mosque and completely decimated the residents, killing hundreds at the command of their Chinese overlords. The Islamists in Pakistan did not look kindly at this unislamic action by the generals, and thus the scourge of the Pakistan Army was born, the Pakistani Taliban. If we look closely the action of the Pakistani Taliban, its actions are more anti Pak Army and China rather than anti-west. In order to coax US and its allies into donating billions of dollars to fight the war on terror; A fictional was created by the Pak Generals where on the surface they seemed to be fighting the Taliban but this was the Pak Taliban not the ISI backed Afghan Taliban. While, the Pakistan Army is busy decimating the Pakistani Taliban. China is have clandestine meetings with the real Taliban i.e. the Afghan Taliban, China is of course not worried about peace in Afghanistan but wants to install a China backed Taliban government in Afghanistan. 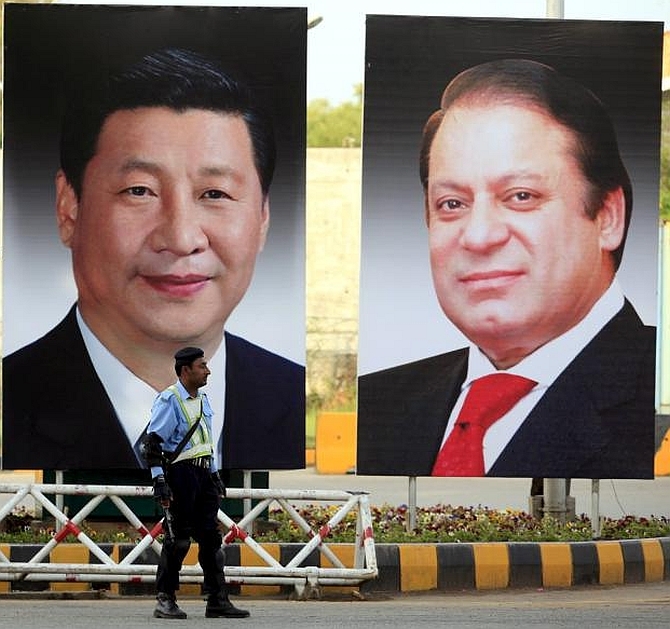 By backing Pakistan, and providing it with Billions of dollars worth of aid in Financial and Military terms, a plethora of goals is fulfilled for the Chinese. China is viewed as a pariah state, with no friends and enemies across the globe. China by becoming an all weather friend to Pakistan, now has a genuine strategic partner who will help to achieve China's goals at all costs be it fighting Russians in Afghan or getting insights in the global Jihadi network. By propping up Pakistan, China is also able keep India occupied, India who is a growing power has unfortunately never been able to even get close to China as it is always busy fending attacks from its neighbor Pakistan. An additional goal of the Chinese has been to suppress the Muslim dissidents of Xinjiang. Muslims are treated as second class citizens by the Chinese, they are not free to practice their religion and are discriminated against. An fighting band of Muslims in the Xinjiang province has been opposing Chinese rule for decades but all in futility. This band of fighters is looked on as a threat to China by the CPC. Some of these fighters escaped to Afghan and Pak, but Pakistan instead of helping their fellow Islamists and defending Islam, sold the Uighur fighters for Chinese dollars. The book also goes into details of how China has made several large investments in Pak and how it helped Pak become a nuclear state. I was also surprised to read that each new Pak General or PM has to first visit Beijing to pay respects to his masters, a failure to do so can lead to a temporary freeze in relationships like we saw with Mr. Zardari. No surprises for guessing China prefers Military dictators to civilian rulers. Who knows maybe this is the reason why there are so many coups in this mercenary state? P.S. - This was not one of the most objective book reviews, its heavily sprinkled with my own thoughts and analysis. This is an important book to understand the relationship which in the coming years will change the outlook of Asia and maybe the entire world.